TRENTON — The state Assembly took its final step Monday toward placing a referendum on the fall ballot asking voters to commit to spending billions of dollars to repair the public worker pension system. A coalition at Rutgers is pushing for a rollback of 2.5 percent when the governing board sets tuition and fees next month for the 2016-17 school year. 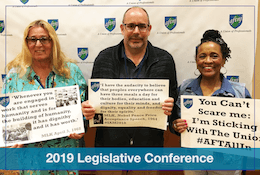 UNION COUNTY, NJ — Delegates to the 102nd annual meeting of the American Association of University Professors voted in Washington, D.C. last week to place Union County College on its list of institutions sanctioned for violating AAUP-supported standards of academic government.